Guns N’ Roses was brought in recently, fixed, and picked up the same day. It had some minor issues. The right sling shot was chattering, there were a few bulbs not working, and I found quite a few loose screws on the playfield that were tightened up. I also cleaned and waxed the playfield, rocked a few games, and out the door it went. It’s a real fun game! 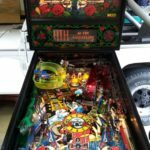 This entry was posted in Repairs, Mods & Shop Outs and tagged data east, Guns N Roses, Pinball, repair, tampa by Pinball Shark. Bookmark the permalink.